(Photo by Chip Somodevilla/Getty Images)Hundreds of white nationalists, neo-Nazis and members of the ‘alt-right’ march during the Unite the Right rally on August 12, 2017 in Charlottesville, Virginia. On Monday, “Vice News Tonight” published a chilling 22-minute documentary featuring interviews with several of the white nationalists who helped lead the “Unite the Right” rally that devolved into violence and chaos in Charlottesville, Virginia over the weekend. Most prominently featured throughout the episode is Christopher Cantwell, a white supremacist who offers an in-depth description of his beliefs and his movement’s goals at the rally to VICE correspondent Elle Reeves. “I’m carrying a pistol, I go to the gym all the time, I’m trying to make myself more capable of violence,” he says. “I’m not even saying we’re non-violent. I’m saying that f—— we did not aggress [sic]. We did not initiate force against anybody. We’re not non-violent, we’ll f—— kill these people if we have to,” he says. At one point, Cantwell even says he hopes for a leader who is “a lot more racist than Donald Trump” and who “does not give his daughter to a Jew,” referring to the marriage between Trump’s daughter Ivanka and Jared Kushner, who are Jewish. “I don’t think that you could feel about race the way that I do, and watch that Kushner b—— walk around with that beautiful girl, ok?” Cantwell said. Getty Images/Chip SomodevillaThe scene in Charlottesville on Saturday. As VICE’s interview with Cantwell shows, the white nationalists at the rally openly embraced racism and violence as they descended on Charlottesville last weekend. 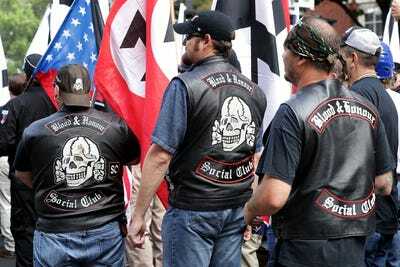 Cantwell’s comments, apart from their shock value, reveal the extremity of the views of the “Unite the Right” attendees — a point that critics of President Donald Trump have struggled to impress upon him in the wake of the deadly rally. Trump has, so far, condemned the white nationalists, white supremacists, and neo-Nazis at the rally mostly by equating their actions with counter-protesters whom he called the “alt-left,” a term that was created by white nationalists and in fact refers to no specific group that self-identifies under the label. 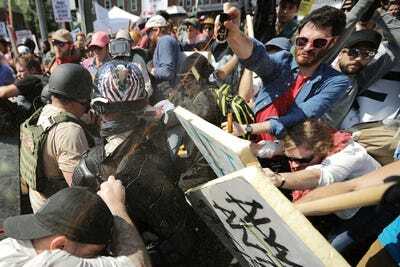 Trump’s equivalence between the actions of the white nationalists and those of the counter-protesters has drawn backlash both from Trump critics and members of his own party, who have been nearly united in their condemnation of the “Unite the Right” rally and of his comments.